Simmons memory foam mattress line is called ComforPedic. Memory foam mattresses aren't anything new; in fact they've been around for years. They haven't been without their share of problems though. One issue that people run into is that some memory foam doesn't seem to forget fast enough. This might sound odd, but if you think about it, you really want the mattress to adjust to the way that your body is moving. If it can't do that then you have a problem because it's going to keep its shape for far too long and make it very difficult for you to move in your sleep. People often complain about this, saying that they feel as if they have to climb out of a hole to get out of bed in the morning. Another problem that you might find yourself running into with a cheap memory foam mattress is that laying on it is akin to lying in a pool of quicksand. This definitely isn't something that you want to see in a mattress for any reason. It also means that it will not be able to support you properly, so you're going to find that you feel more tired in the morning than you did when you lay down at night. Regular visco foam tends to store heat, meaning that you might wake up in the morning in a pool of sweat. This isn't something that you're going to run into with the Simmons memory foam mattress because the material is capable of breathing so it adjusts to your body temperature. It allows excess heat to escape so that you can have a good night's rest in most climates. The company's product line includes several different models, each characterized by a layered construction designed to appeal to different consumer tastes for firmness, heat dissipation and other features. Everyone has their own unique criteria for what makes an optimally comfortable surface, which means that mattress manufacturers neglect to offer consumers a wide range of choices at their peril. These Simmons memory foam mattress sets must be selling well because they offer quite a few different choices. There's even a Simmons pillow line made from memory foam. The models you'll find in the Simmons memory foam mattress Loft collection include the Dreamy Sky, Sparkling Stars, Enchanting Star (who comes up with these names? ), Silver Moon, and Bright Nights, along with the luxury Simmons Beautyrest Recharge Collection. Of course, as is the case with nost mattresses, some models may have different names at each store just to make things extra confusing. However, for our purposes here we'll use these particular names in order to give you a general idea of the differences between price points. 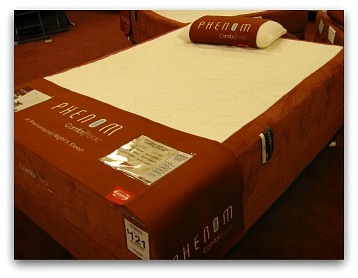 There is even a special model available only at Sleepy's called the Phenom that many people may be familiar with. It looks different but is basically a repackaged version of their Loft models. As you climb the ladder of prices each general model (regardless of name) has its own unique construction and feature set; read on for more information on the Comforpedic line from Simmons. The entry model of Simmons memory foam mattress is called the Dreamy Sky. It may be the entry model but is in no way outdated and you'll find that it holds up quite well. 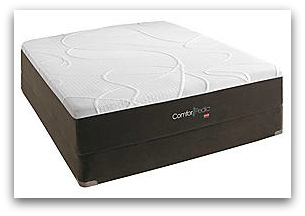 It is constructed using Simmons' cutting-edge NxG Memory Foam along with conventional foam. 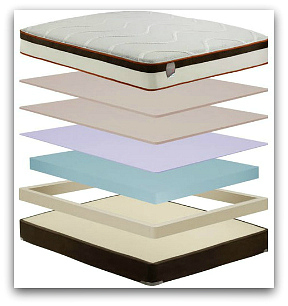 The mattress has a height of 8.5" and is available in plush through firm styles. A removable knit mattress cover (which can be dry cleaned) with suede border is included. All models of Simmons memory foam mattresses are also available with their Nuflex adjustable bed instead of a regular foundation. However, one would imagine that the adjustable bed costs more than the mattress itself. The Dreamy Sky also incorporates Simmons Transflexion Comfort technology to maintain the mattress' quality for many years to come. So what exactly does Transflexion mean? Is that even a word? This is a perfect example of what we call "mattress speak". It's those strange made up words that no one understands and makes people's eyes glaze over when they're trying to shop. It's almost like you have to learn a whole new language just to buy a mattress! Well, from what we can tell, Transflexion is a process used to break in the surface and soften it up before you bring it home. People often complain that the mattress delivered to their house feels much harder and more uncomfortable than the one they tested on the showroom floor. Sometimes people even feel like they've been tricked into buying something they didn't want. However, what's really going on here is that the mattress in the store is already broken in by all the customers who have been testing it. It only makes sense that a brand new untouched mattress will feel firmer. So Simmons breaks the mattress in for you by some process of applying pressure repeatedly to the surface over a certain period of time. They probably use a machine in the factory that rolls a heavy cylinder back and forth on the mattress or maybe just a platform that presses down repeatedly with a certain amount of pressure. It's kind of like buying pre-washed jeans. They're more comfortable and you know they're going to fit because they won't shrink. It's actually a really good idea when you think about it. So why can't they think of something to call it besides "Transflexion" that people can actually understand? 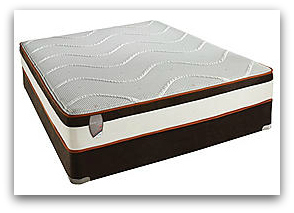 The Sparkling Stars is the next step up the line and has a thicker layer of memory foam on top. Constructed with Advanced NxG Memory Foam and the Aircool design, this 9.5" mattress has Transflexion Comfort technology, 360 Gradient Edge Support and a knit mattress cover. It also has the edge support system to strengthen the sides. It is an exceptionally comfortable mattress, whether you prefer a firm or plush bed. It is available with Simmons' NuFlex adjustable base as well. The Enchanting Star includes more state-of-the-art NxG Foam than any other Simmons Memory Foam Mattress in the line up to this point, with a height of 10". It also adds their new Micro Gel Touch memory foam which gives it a different and more supportive feel. The Enchanting Star is a great choice as it features all of the same things you'd expect from a Comforpedic mattress, such as a removable knit cover and 360 degree Gradient Edge support. The main difference here is a thicker memory foam topper which makes it even more comfortable. It has the usual choice of firm or plush styles along with the optional NuFlex adjustable base. The Silver Moon is an even more luxurious variation on the Enchanting Star and we're getting into more expensive territory here. It has an 11" profile and includes all of the same integrated and optional features. But the layers of high quality memory foam are thicker so you're getting less of the cheap polyurethane foam that most mattress companies use in the bottom support layer. 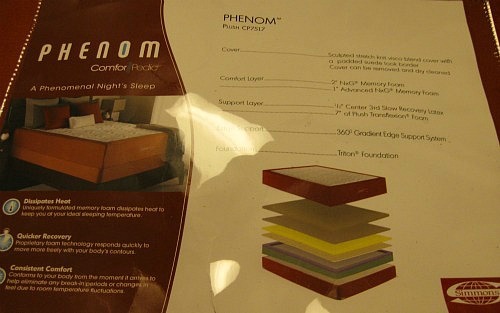 They also make the layer of Micro Gel Touch thicker which helps the mattress to cool down more easily. It has a more expensive cover made from high end stretch knit fabrics as well. Consumers can choose between a firm or plush Silver Moon. 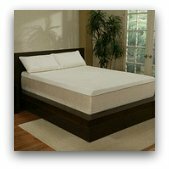 The top of the line Bright Nights mattress offers their Advanced NxG Memory Foam and all of the other comfort layers you'll find in many of the previous mattresses, but with one very important addition. It has a thicker layer of Gel Touch material on top which adds even better cooling and a new level of luxury. The heat dispersion is meant to keep sleepers cool and comfortable all night. This "gel memory foam" material is the newest technology available. All the mattress manufacturers are now promoting it in one way or another, as cooler and more comfortable. It's the latest craze in the bedding industry and we're still not sure if it lives up to the hype. Only time will tell if it's here to stay or is just another passing fad. One thing is certain though - The Bright Nights has the thickest memory foam layer of all and a smoother sleeping surface for the ultimate pampering. Being the top of the line Simmons Comforpedic Loft means it won't be cheap and I'm sure you can imagine what kind of money we're talking here. It includes Simmons' Transflexion Comfort technology, a removable high-end knit mattress cover, 360 degree Gradient Support and naturally, it's available in firm or plush. Super high-end luxury mattresses have really taken off lately and are becoming a bigger part of the bedding industry than ever before. Consumers are willing to spend much more for a high quality bed than they were in the past. It does make sense considering you're going to be spending about 8 hours a day lying on it. If you're not comfortable it can make a major impact on your quality of life. Nearly every major manufacturer now has a separate "luxury brand" and some, like Simmons, actually have several to cover different areas of the market. Beautyrest Black is their luxury brand for their regular coiled spring mattresses and now they offer the Beautyrest Recharge Collection as their luxury brand for the growing memory foam market. The Simmons Memory Foam mattresses in the Beautyrest Recharge Collection are completely redesigned in order to address some of the major problems with this material in general. Their new AirCool sleep system affects nearly every part the construction and is designed to allow air flow throughout the entire mattress. Normally air can't really flow through most types of foam, especially high quality memory foam which is dense and heavy. This causes not only extreme heat retention but also moisture build up. This has always been one of the major issues with visco elastic foam and different companies have tackled the problem with varying levels of success. Simmons AirCool system makes four major changes in their mattress design: their AirCool Edge Support, AirCool Mesh Border, AirCool High Performance Comfort Layer, and their AirCool Transflexion Core. Taken together these changes address all the major areas where you need better airflow in a memory foam mattress. It's really a great idea and should be worth paying extra for these high end luxury mattresses. The various models in the Recharge line are rather similar in construction, coming in levels one through four (the Key Largo, Mykonos, Seabrooke, and St. Simons, respectively). Each model includes Simmons NxG Memory foam and the AirCool Sleep System to ensure a comfortable, restful night's sleep. Unlike their other mattresses, each model only comes in one firmness level, but with four different options, everyone (who can afford one) should be able to find something to suit their taste. The Key Largo (level 1) is a plush mattress, while the Mykonos (level 2) is a luxury firm model with the same basic construction. They have nice thick layers of memory foam and high quality materials are used throughout. The level 3 offering (Seabrooke) adds more MicroGel Touch technology to the comfort layer for added support, cooling and motion isolation. It is a deluxe plush style. The advanced "gel memory foam" layer adds a whole new level of comfort and really changes the feel of these Simmons mattress sets. Level 4 (St.Simons, a luxury firm style) includes even more NxG and MicroGel Touch material along with the AirCool Sleep System. This is a model which is designed with the consumer who demands an exceptionally supportive yet soft surface in mind. This is one of the the most luxurious models in the Simmons Memory Foam mattress product line. Another cool option from Simmons is The NuFlex foundation. 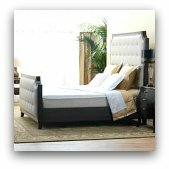 It's not just a mattress but an entire sleep system that includes a Simmons adjustable bed. The great thing about foam mattresses is that they won't be damaged when bent or folded in the way that a traditional innerspring unit would be. This makes them perfect for use in adjustable beds. This is one nice piece of machinery if you can afford it. It's built to look like a piece of fine furniture that you would find in an upper class master bedroom. It actually has three different motors which allow it to adjust to a huge range of positions, many more than a regular adjustable bed. It comes with a wireless backlit hand wand pre-programmed with the most common positions like feet up or head up. It can also be custom programmed to take any position you like. Even better, it has various massage settings for your feet and back. If I had one it would be dangerous because I might never want to get out of bed again! It looks amazing but it's probably a lot more than most people need or can afford - definitely a luxury item. Online reviews have been overwhelmingly positive for the Comforpedic. With a customer satisfaction rate of over 90 percent, these are undoubtedly quality products. We have no reservations in giving them our highest recommendation. In conclusion, no matter what you're looking for, there's a Simmons memory foam mattress in the Comforpedic line that will give you the night's rest you've been looking for. Stop tossing and turning, after all you're supposed to get a new one every seven years or so. What are you waiting for? 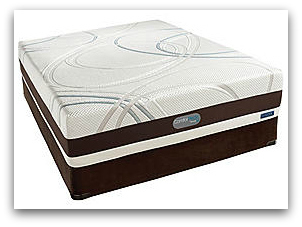 If you're interested in purchasing a Simmons memory foam mattress online we recommend Wayfair. They have some of the lowest prices anywhere and their website is well organized so it's a breeze to find what you're looking for. They offer free in-home delivery and setup which is much better than the curbside delivery offered by many others. Plus they have a 100 day comfort guarantee!